Dixie Doodles is an independent pet shop only a few minutes from Stirling town centre. In our contemporary shop, you’ll find a range of quality food, treats and accessories for dogs, cats and their humans. We have everything from the purely practical to ultimate luxury. Our promise is to help our customers look after their pets by supplying top quality products, supported with knowledgeable and friendly service. We’ll do our very best to help you do the best for your furry friend. The Avonside Inn is situated in Avonbridge a stones throw away from the River Avon heritage trail. We welcome dogs in the bar area and in the games room. The Canalside is situated on the outskirts of Falkirk town centre along the Union Canal. We are a casual dining restaurant and pub, open from 9am daily serving freshly prepared food until 8:30pm. We have a wide range of snacks & menus to cater for everyone. Cosy corners for your four legged friend, where our doggy loving staff and friendly locals love meeting a new waggy tail. Our Bar is Strictly Over 18s only. However we do have a patio area where both dogs and children are welcome. Dog friendly bar. Food served. Cafe set within the Smith Museum. All dogs welcome. The Real Food Cafe is situated on the main A82 and the West Highland Way at Tyndrum approximately half way between Glasgow and Fort William. We love and welcome dogs at the cafe (and their well behaved owners). National Fish & Chip award winner 2013 & 2014. 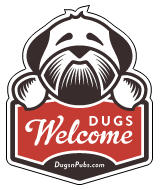 There are a total of 7 dog friendly listings in the Featured Stirlingshire category. Please log in, or sign up as a member to view all listings.